Explanation: What's happening over Bryce Canyon? Two different optical effects that were captured in one image taken earlier this month. Both effects needed to have the Sun situated directly behind the photographer. 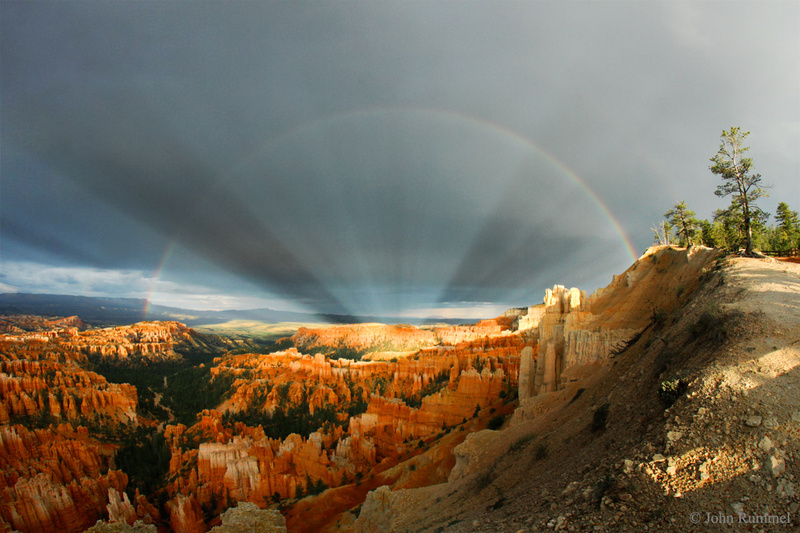 The nearest apparition was the common rainbow, created by sunlight streaming from the setting sun over the head of the photographer, and scattering from raindrops in front of the canyon. If you look closely, even a second rainbow appears above the first. More rare, and perhaps more striking, are the rays of light that emanate out from the horizon above the canyon. These are known as anticrepuscular rays and result from sunlight streaming though breaks in the clouds, around the sky, and converging at the point 180 degrees around from the Sun. Geometrically, this antisolar point must coincide with the exact centre of the rainbows. Located in Utah, USA, Bryce Canyon itself contains a picturesque array of ancient sedimentary rock spires known as hoodoos.